Getting the keys to a new house or apartment is an exciting time. It signals a blank canvas upon which you can start a new beginning – both figuratively and in terms of your interiors. For those interested in interiors, this is a dream concept as it presents the opportunity to style a whole new space. If you’re looking to style a new house – or re-style your existing place – there are certain things you can do to ensure it is as homely, as comfortable and as inviting as possible. Heed these 3 top interior tips today to make your house a home. Flowers and houseplants breathe life and colour into any home. They have the ability to transform any space and make it beautiful, and with so many different types of flowers on offer, you will never get bored of the selection process. Sunflowers – It’s no surprise that sunflowers can brighten up any room. They are, after all, the ultimate symbol of cheer and joyfulness. Sweet Peas – Symbolic of bliss and pleasure, sweet peas are a great addition to any home. Better yet, they’re easy to grow (just be sure to take advantage of cooler Spring climates). Orchid – There are approximately 30,000 varieties of orchid in the world – in all different shapes and colours – making them the largest group of plants. Select your favourite kind and then with some careful attention you can enjoy their full bloom multiple times in one year. African Violets – These easy-to-grow flowers are popular houseplants. They require little-to-no effort and bloom all year round. What’s more, there are many different types of African violets – each type as vibrant and as warming as the last. Peace Lilies – If you really want to add some style and class to your home, a peace lily will create just the right atmosphere. Be sure to place them in a warm environment under filtered light as this is how these tropical plants will bloom, and you can enjoy their flowers all summer long. Jasmine – These flowers are not only beautiful to look at, but they also have a beautiful scent that is perfect for filling a home. Fragrant jasmines come in many shades of pink and white, meaning they can add a soft finish to your living area. Amaryllis – This flower is beautiful both in its appearance and its meaning. Representative of splendid beauty, the deep-hued amaryllis bulb is arguably the most spectacular of all, making it a welcome addition to any home. Amaryllis varieties include deep red, pink, orange and salmon-coloured, so you can find a shade to complement your interiors. Hibiscus – If you really want to make a statement in your home, you might consider getting hibiscus (aka rosemallows). However, it must be noted that these tropical flowers are difficult to keep alive and should not be bought frivolously. They require both a warm and humid climate with a lot of light, as well as a pair of expert green fingers to manipulate their growth to perfection. Oxalis – Oxalis is a rare beauty and would make a show stopping addition to a new home. Their deep purple-coloured leaves with green foliage in a shamrock shape is simply charming (and a great gift to give on St Patrick’s Day). Whatever your home style or taste, there are Flowers for Everyone. Inject some life into your living space today to create a homely feel. The key to creating an inviting space is investing in soft furnishings: throws, rugs, cushions, pillows, curtains, blankets, etc. In fact, you can turn a bland piece of furniture – a sofa or a bed, for example – by dressing it in soft textiles. Nothing says “homely” quite like a set of plush cushions on a sofa and a warm fluffy blanket thrown over the arm. What’s more, fabrics can add dynamic to a space, through both sight and touch. For example, you may choose to inject a pop of colour into your living room by buying a colourful rug and matching it to your sofa cushions or throws. Or, you may choose to buy some new bed sheets with detailing and patterns. This will make the room(s) seem more carefully considered, and in turn comforting. 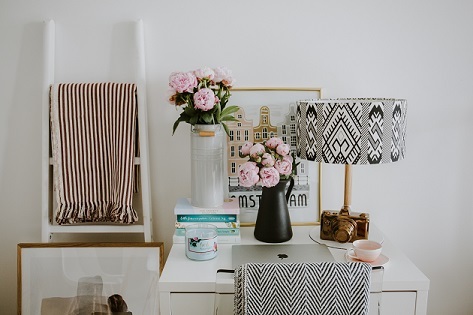 Adding personal touches to your home may not be everyone’s cup of tea – especially when done in excess – but it is a good way to create a homely atmosphere. This doesn’t mean that you should clutter your bookshelves, but you should put things on display that you are proud of, that signify a great time in your life, or that you simply like the look of. This could include photographs of your family or of memorable holidays and trips you have had; it may mean trinkets and bits of memorabilia; it may mean stacking a few of your favourite cooking reads on the shelf in your kitchen; or,it may mean putting your old vinyl player on display in your living room, even if it doesn’t work. These personal items will add depth and character to your home, which will make it feel lived in, homely and warm. But remember, don’t put things on display for the sake of it, or if you don’t necessarily like the items in question. Cleaning guru Marie Kondo urges people to get rid of any items in their home that do not “spark joy”, which is a good mentality to have when decluttering or rearranging your home. Making a house a home is simple. It’s all about putting your own personality into your space in a stylish and considered manner. Remember, not everyone will like your interior style, but if you find it comforting and homely, that’s all that really matters.